I make a joke usually saying that if I knew 10% of what I know now at 19 years old, I may have taken over the world. While I always laugh at myself whenever I say it, the lives of people like this man in focus comes to mind easily, having known him for 13 years and worked closely with him for almost 8 years. Okorie is essentially focused, consistent in his drive, have an amazing can-do spirit, resilient and have qualities of an ideal leader. "Everyone Needs To Be Valued. Everyone Has The Potential To Give Something Back. Join me in Making Africa Better Not Bitter at The Pan African Humanitarian Awards 2016 #DubaiConverge #faithfulGod #iamFBI"
Having been a multiple award winner from many outstanding organisations and institutions of repute, Linus has consistently inspired young people to become leaders in Nigeria. He teaches the essential Leadership capital that everyone needs to be significant at the home front, public service, political office and also at self leadership. His organisation Guardians of the Nation, International (GOTNI) has grown in 22 years from just a high school movement to having a presence in Africa, America and other parts of the world because of the massive impact this man's ideology has made. The popular annual convergence of thought leaders across Nigeria known as the Emerging Leaders Conference is one of his numerous leadership outreach platforms. 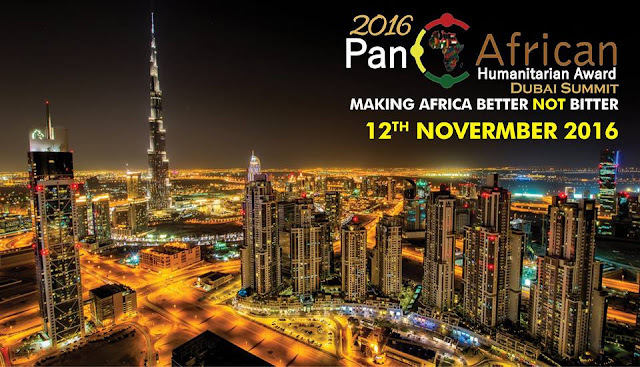 The Pan African Humanitarian Awards is the biggest platform that celebrates Africans who go beyond themselves to help, give hope, nurture and inspire others and the organisers are young people who in themselves are case studies of success for Africa. So it is not a surprise that Linus Okorie was pin-pointed alongside other great Africans like Paul Khulekani Mthabela, Gimbiya Hasfat Balewa, H.E Madam Zineb Jammeh, Amb. 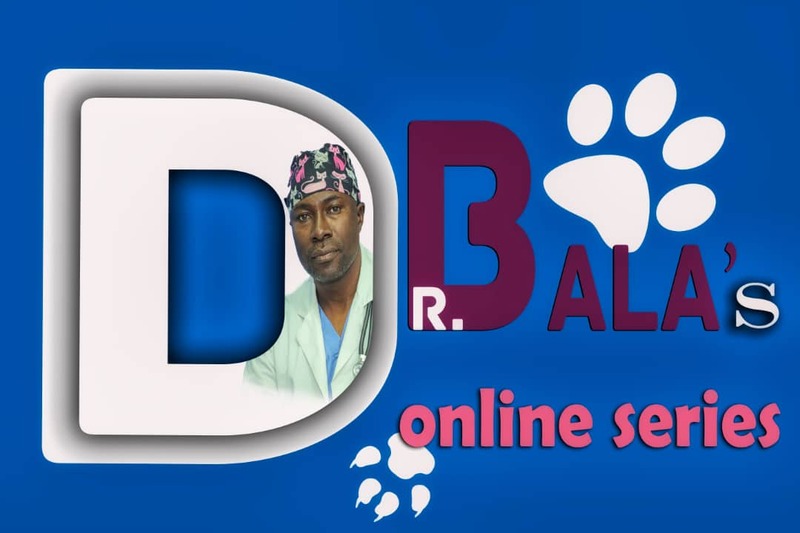 Dr. Wallace W. Williams, Mandela mkhize, Tania Tome, Dr. Innocent Ifediaso Chukwuma OFR, H.E Chinor Emeka, Prof. Mjeneba Traore and more as deserving recipients. We must truly begin to look within and without a sense of bias for tribe, nationality, religion and social status hand pick such Africans to be at the frontiers of leadership mentorship and be the people who occupy positions of influence at all levels of the economy as well as their ilk. That for me is the way out of the poverty-in-the-midst-of-plenty that we have been known for in Africa and for which we all cry out against. 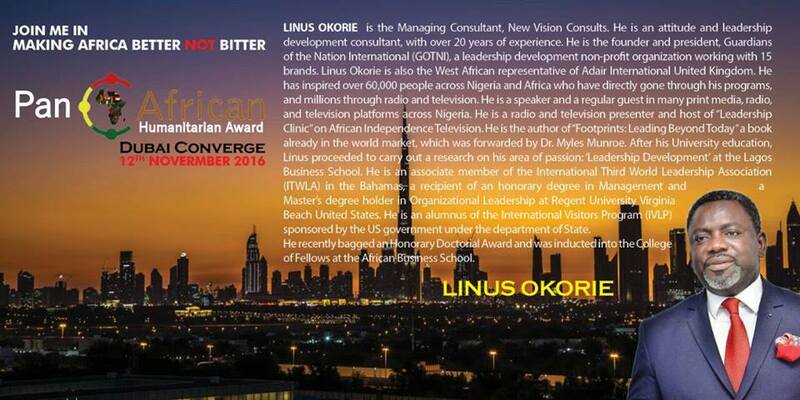 Linus Okorie is one of such Africans who Nigeria should utilize and consult for the next level of leadership and, outstanding leaders. Long Live the Pan African Humanitarian Awards team!